Individual Commentary (pdf file). The message of Obadiah is an example of God’s meting of justice to nations who violently take revenge on others. Obadiah can inspire us to believe that God is The Promise Keeper (the good ones and the bad ones). The Book of Obadiah also teaches us that although one’s work or ministry may not make the headlines or the primetime evening news, nevertheless, there are men and women, marked out by God to do great exploits at crucial times in the history of mankind, and through whom ultimate contributions are left for the subsequent generations. It identifies 7 important leadership topics/lessons and principles derived from these topics. 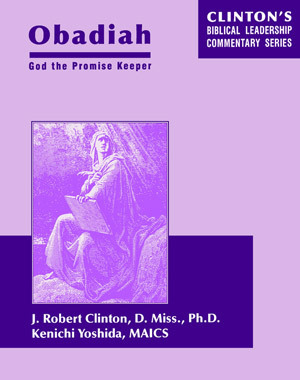 Finally there are 30 leadership articles totaling 121 pages describing various aspects of leadership seen in Obadiah. He inexorably moves forward with His purposes regardless of the ways nations defy Him. We, leaders today, need to be encouraged to believe that God is working toward judgment and justice. We need to believe that God will do what He says we will do. We need to have faith in the promises of God, to us, and for others. Obadiah was such an individual. At a crucial time in the history of the nation of Judah, a time when God’s people desperately needed to hear a word from the LORD, Obadiah was released by the Spirit of God to fulfill his ministry to declare to his and subsequent generations of God’s people, the assuring and comforting word of the LORD. This ought to give leaders a sober perspective on ministry in any generation. This book is one of a series of Biblical leadership commentaries. This series explores the most relevant books of the Bible for leadership findings. The leadership commentary on Obadiah involves an overview of the book of Obadiah, i.e. a recognition of the contribution of the book as a whole to the Bible.